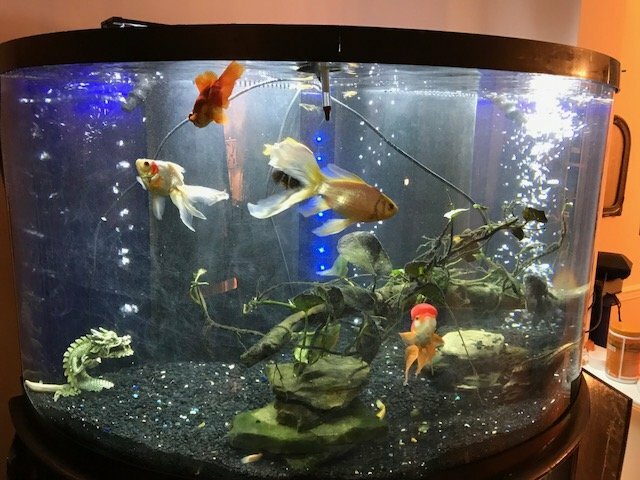 Moved my goldies from a 90 gal to a 150 planted about 3 weeks ago. I usually keep long fin danios in with my goldies, also mystery snails and 5 golden weather loaches. I moved 7 of the danios with 8 goldies into the new 150. Within 2 days I could only find 5 of the danios. I added lots of new plants, partly to provide more hiding places for the little ones. About a week later I added 6 more danios. I can't always get a good head count with all the plants, logs and rocks so I thought the danios were just hiding. I now think there are only 2 left out of 11 and one of the ryukins is all of a sudden like twice her previous size. She's so bloated she looks like a puffer. OK so I've come to the conclusion that I can't keep danios in there any more. Now today I do a headcount of the goldies and there are only 8 (I added one since the move - there are supposed to be 9!). The smallest one, but not that small, is missing - completely. I think my blimpy ryukin is on a murderous, canibalism spree and not sure what to do. There's really only one goldy, another ryukin that's smaller than her. Anybody experience anything like this? Do I have to remove her? Should I play "Don't bite your friends" from Yo Gabba Gabba for her? Any other ideas? Could you show a picture of the bloated fish? It may have dropsy. Please fill out this form so we can identify any developing problems. Any unusual behavior like staying at the bottom, not eating, etc.? Thanks for your reply. This isn't a fish health or water quality problem - it's a behavioral concern. This "little" ryukin plumped up because he or she ate a bunch of her roommates. The picture on the left is her yesterday and in the picture on the right she's in the middle left. That's from about two weeks ago. There are 8 goldfish, 5 weather loaches, 2 long fin danios and 4-6 mystery snails in the 150 gallon, planted tank. It's been set up for 2 or 3 weeks. Before that they were all in a 90 from which I transferred about 15 gallons of good, cycled water, the filter media, the gravel substrate, a large log, plants and several rocks. When I tested for ammonia about a week after i set it up there was 0. Ph tends to run a little high from the tap - I don't remember, 7.4-ish. It has a customized Eshopps sump filter with mechanical, biological and carbon filter components. I set up a trickle over the Eheim bio media. No meds added to the tank. I feed them 1x per day, flakes and Excel micro pellets. Occasionally I give them green beans or peas. Water temp is 66-70 F. No heater. No unusual symptoms on the fish and no unusual behaviors observed - just the missing fish and the greatly increased girth of Tripod here. And looking at it, I do not see it been able to eat any other goldfish that were not fry sized. Dropsy can be very hard to cure, often even the best efforts don't make a difference. But what I would do is move the fish to a Quarantine. I find a 10g QT is best for ease of dosing meds. Dose with Plain Epsom Salt at 1/4 Teaspoon per 10g. Do you have any meds on hand? My normal dropsy routine consists of Metronidazole (Seachem Metroplex), Trisulfa and Oxytetracycline. Yes the fish has a severe case of dropsy, which is kidney failure. Causes of dropsy include internal infections, injuries, poor water quality and other stresses. Overeating will not cause dropsy. Read this article. Dropsied fish usually die, but we have had some success in treating them. 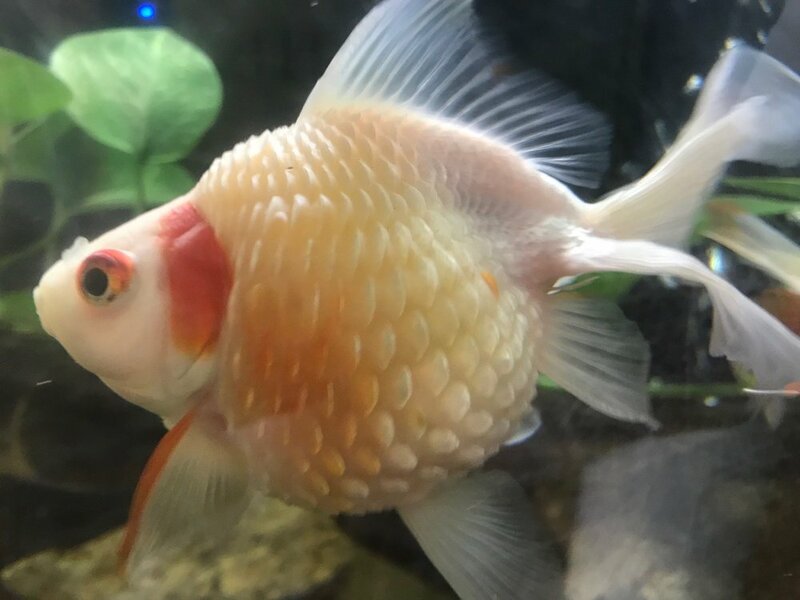 Until we have your completed form, we only have enough information to recommend the 10 gallon quarantine tank (which can be a plastic storage tote) with 1/4 teaspoon of epsom salt per 10 gallons and daily water changes.